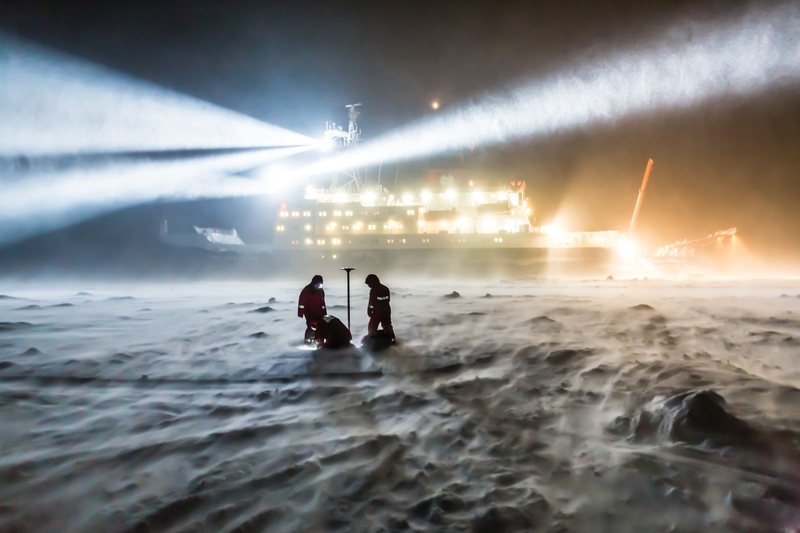 AWI sea ice physicists taking measurements on the sea ice in the darkness of the polar night. Since March 1st 2015, European polar research institutions have been moving towards ever closer collaboration thanks to a new initiative funded by the European Commission: EU-PolarNet. With 22 research institutions across 17 European countries involved, the initiative is the world’s largest consortium of expertise and infrastructure for polar research. Coordinated by the Alfred Wegener Institute for Polar and Marine Research (AWI) in Germany, the goal of the five-year project is to create ever-closer collaboration between Europe’s numerous institutions that carry out research in the Arctic and the Antarctic. AWI director, Professor Karin Lochte, explains the initiative in her latest interview with SciencePoles. Where did the idea of EU-PolarNet originate? Why was there a need to establish a network of European polar research institutions? Polar research is very relevant for policymakers. There are all sorts of questions that have arisen from climate change. The observations researchers have been doing in the Arctic and Antarctic can inform decision-makers about what we know, and what changes to expect and be prepared for. And with the EU putting together its new Arctic Strategy, the EU has a particular interest in what’s happening in the Arctic. But polar research is a very expensive undertaking at the national level. So there was a call for tender from the European Commission looking for ways to foster better collaboration between the different polar research institutions throughout Europe. In order to save costs, EU-PolarNet has started to investigate how to make better use of each European country’s polar logistical support and infrastructure. So EU-PolarNet is trying to find synergies between the different national polar research programmes in Europe? Yes. Synergies is the key word. Research priorities in the world of polar research in both the Arctic and the Antarctic are usually defined on an international level - by IASC (International Arctic Science Committee), and SCAR (Scientific Committee on Antarctic Research). Both international scientific bodies have representatives from countries from around the world active in Arctic and/or Antarctic research. Once IASC and SCAR identify research priorities, then the national research institutes in each country pick up on these priorities and design their individual national research programmes around them. Each country has its own national research interests and specialised expertise, of course. Norway, for example, has a big focus on fisheries, as it’s a major part of the Norwegian economy. But overall, countries use the IASC and SCAR recommendations to guide their research programmes. Do research programmes in different countries sometimes overlap? Yes, research programmes do sometimes overlap. So it makes sense to look at all the research projects that are planned and see which projects can be done together, in order to make the best possible use of expertise and infrastructure such as ships, aircraft and research stations. EU-PolarNet is tasked with coming up with a pan-European polar research programme that optimises research infrastructure between European countries. We need to get the best value for the money we spend on polar research. What research priorities would be considered of general international interest, where collaboration between countries is encouraged, or even necessary? Shrinking sea ice cover in the Arctic, is one topic. 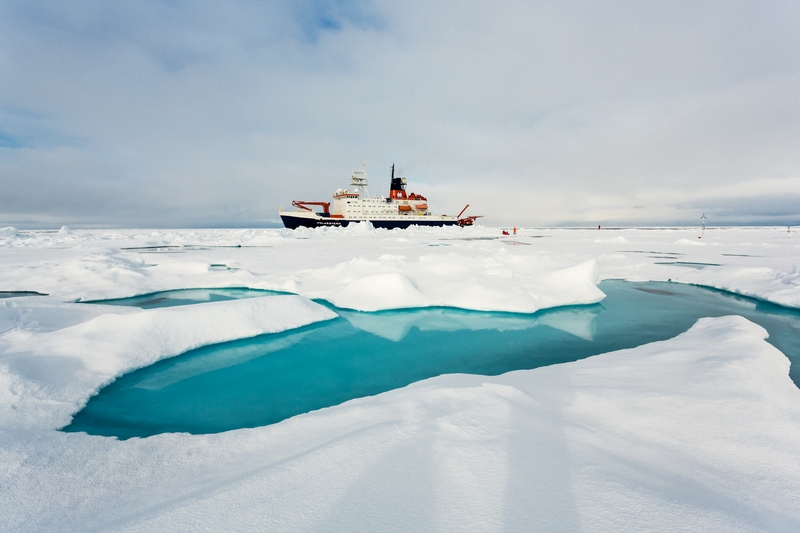 Researchers would like to better understand the consequences retreating sea ice cover will have on exchanges between the Arctic ocean and atmosphere, and how changes in this dynamic might influence climate elsewhere on the planet, such as Europe, Asia and North America. Also of interest are the consequences of thawing permafrost on both land and sea, as it has the potential to release into the atmosphere large amounts of methane (CH4) - a much more powerful greenhouse gas compared to carbon dioxide (CO2). So thawing permafrost could contribute to even further warming. It would also lead to soil erosion along coastlines, and on land it can lead to damaged infrastructure, as roads and buildings lose solid frozen ground that had previously been supporting them. And of course ice loss from the Greenland and Antarctic ice sheets is of great interest to scientists. As the ice sheets are losing ice to the ocean through surface melt and contact with a warming ocean in some areas, this contributes to global sea level rise, which is a concern for low-lying coastal communities around the world. To what extent are observing systems and data sharing on the international polar research agenda? Observing the poles is a big issue for polar researchers. The Arctic and Antarctic are difficult and hostile environments in which to make observations, so we have to make the most out of the observation infrastructure available, and create and foster networks that keep this observation infrastructure in place. Making the data collected in the polar regions freely available to scientists internationally is also an important topic of great interest to all scientists. Making data freely available also avoids the same data being taken twice, which translates into cost savings. How much money would be saved between European countries with greater collaboration between research institutions? It’s very difficult to give an exact figure. But I think the major savings will be in terms of sharing available infrastructure. If two different countries send two different ships to do the same kind of research, it would save money to combine the research programmes and only take one ship. This would save something on the order of a few million Euros in research costs. As they are sponsoring this initiative, what will the European Commission get out of greater collaboration in polar research? The savings will most likely come from the national research budgets of each country. The European Commission will have an advantage in that the polar research community will be speaking with one voice, outlining exactly what the research needs are, so a coordinated research programme can be established. For instance, if I have one group of researchers from one country who is good at, say, physical oceanography, and another who is good at fisheries or marine mammal research, you can include both on the same research voyage. And the collaboration between different disciplines tends to lead to better and more thorough results. So certain European countries have certain strengths in particular research sectors? Yes, but even more so certain institutions, I would say. Europe has a wide variety of research and observation infrastructure, both in the Arctic and the Antarctic. This includes not only research stations, aircraft, and ships, but also analytical tools and data bases. This is what makes polar research so expensive. So one of our main goals will be to find ways to best share polar research infrastructure, and do it in a way that is fair for all the nations involved. EU Polar-Net will also evaluate various proposals as they come along. Will any new polar research be conducted with the EU funding EU-PolarNet is receiving? EU-PolarNet is a coordination and support action. We are not meant to conduct any research with the money we’re receiving from the EU. 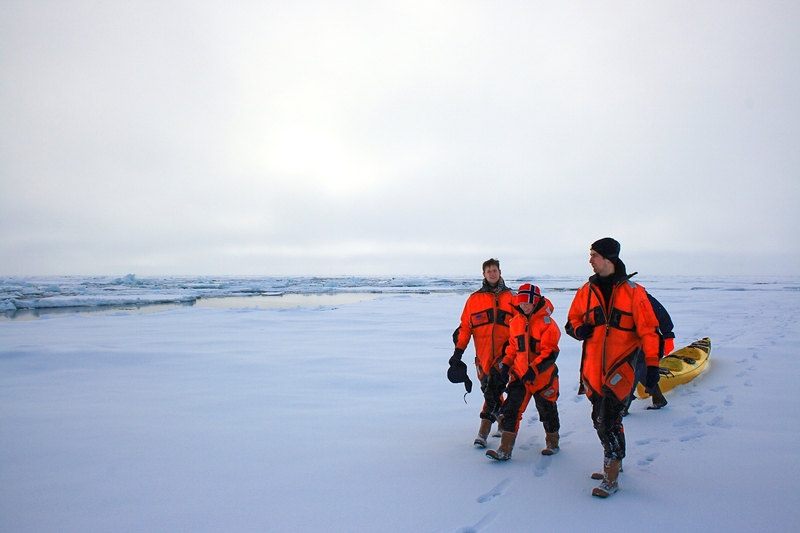 We’re meant to coordinate and support research between different European polar research organisations, and advise the EU Commission regarding the topics that should be addressed in their calls for tender aimed at funding polar research projects. Part of EU-PolarNet’s mandate is to encourage communication between scientists, business leaders, and policymakers. What potential areas of cooperation do you see between these different stakeholders? It’s a big topic, because there are industries such as shipping, tourism, and the extractive industries (minerals, oil and gas). They’re all very interested in what’s going to happen in the Arctic. They need to have good forecasts on sea ice development, for instance. We’ll be working closely with the business community to find out exactly what they need. Can their needs be met with information from current research, or are there new products that they need that would require further research? Of course, these dialogues are only just beginning. I think we still have a long way to go before we’re able to have a good dialogue with stakeholders - not just in industry, but also with policymakers, educators, and even national weather forecasting services. So the goal is to work with a broad range of stakeholders? Personally, I think we’ll have to see with which stakeholders we will be able to work best. After some time, it may be that we concentrate on working with specific groups of stakeholders where we feel that our collaboration is of the greatest benefit. To what extent will the work of EU-PolarNet would contribute to the work of the Arctic Council’s working groups? Some of EU-PolarNet’s member organisations are observers in the Arctic Council, and some are also in the working groups. AMAP (Arctic Marine Assessment Programme), an Arctic Council working group, is also part of EU Polar-Net. The EU Arctic Information Centre (EUAIC) consortium is also involved, and many of these member organisations are already involved with the Arctic Council. So there is a close working relationship with the Arctic Council. How long will the EU-PolarNet initiative run? It’s currently projected to last until 2020. At the moment we’re being pushed quite hard to come up with the first suggestions for the European commission. They’d like to start soon with some calls for projects. The first ones are expected to come out later in 2015 and 2016. We’re in the beginning phase for the moment. But once we’ve found the best ways to make use of research infrastructure, and to work together as a group, I think this initiative will go a long way. Karin Lochte is Director of the Alfred Wegener Institute for Polar and Marine Research (AWI) in Bremerhaven, Germany and a Professor of Marine Biology. Over her career, she has conducted research on the carbon and nitrogen cycles in marine environments, including investigating iron fertilisation as a potential means to sequester carbon dioxide from the atmosphere in the ocean. Prior to becoming AWI Director, Professor Lochte has been Director of the Biological Oceanography Research Unit at the Leibniz Institute of Marine Sciences at the University of Kiel, and prior to that, Director of the Biological Oceanography Research Department at the Leibniz Institute for Baltic Sea Research. 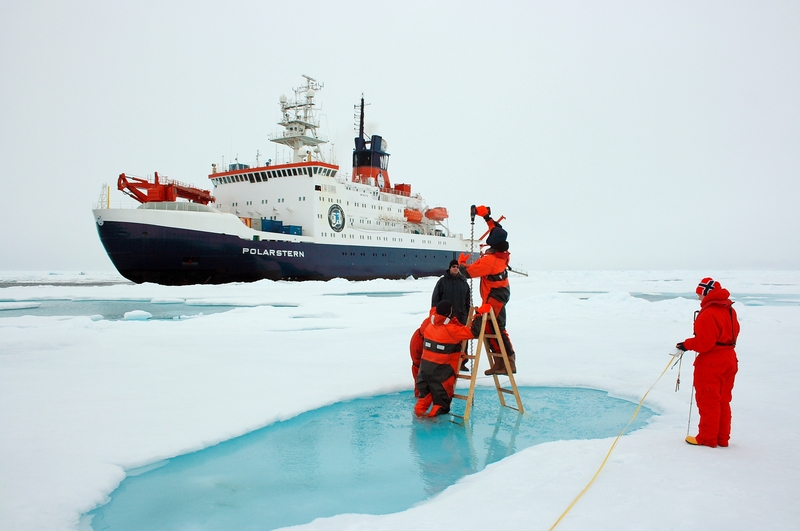 The Alfred Wegener Institute's research vessel, Polarstern, on a mission in the central Arctic. 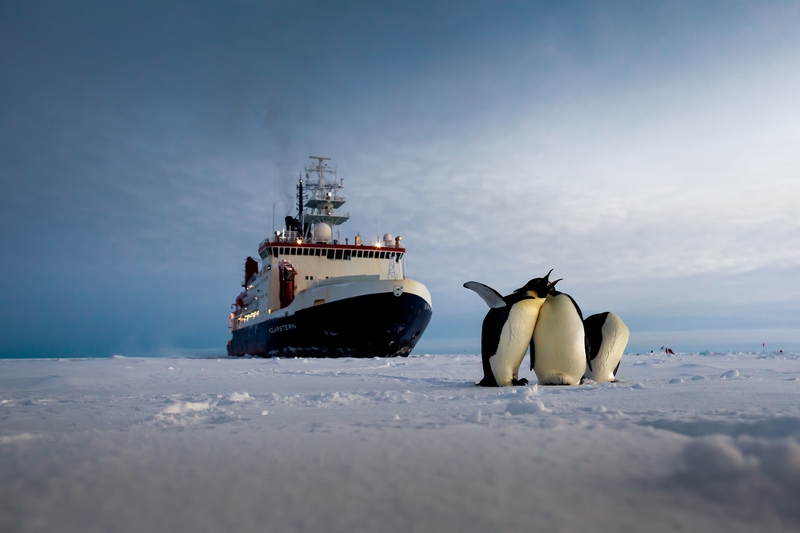 The Alfred Wegener Institute's research vessel, Polarstern, encounters some penguins while on mission in Antarctica. Scientists using a "mummy chair" to take samples while on thin sea ice. Scientists taking ice thickness measurements using electromagnetic induction sounding. 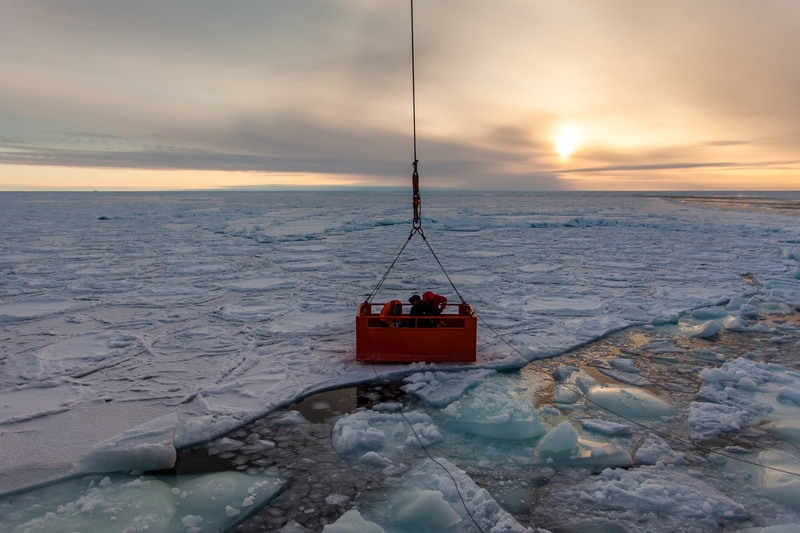 Using an ice drill to measure sea ice thickness.